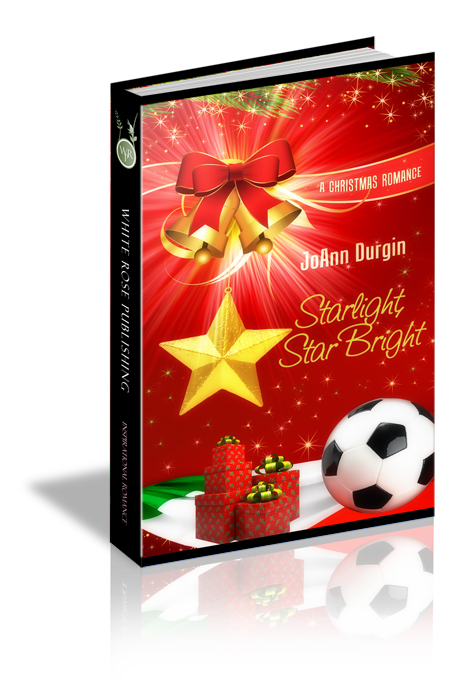 Dante Moretti, Texas-born goalie of an Italian World Cup champion team, expects Starlight, Iowa will be only a blip on the radar of his life. Grabbing a quick meal at Barney’s Diner during the holidays, Dante meets two women who capture his heart in very different ways. Then his rental car won’t start and leaves him stranded. Does the Lord have a plan for bringing him—and keeping him—in Starlight? Amanda Marston is excited to be home for her brother’s wedding. When she drops in for a cup of coffee at Barney’s, she’s charmed by the mysterious, Italian-spouting cowboy. Before she can blink, the handsome stranger is helping with projects all over town and working his way into her heart. Does God have a plan for Dante in her beloved little Starlight or will he take her heart with him when he returns to Italy? The look. Dante had seen it enough to recognize the telltale signs. If he could put off her questions long enough, he’d have time to gulp down a cup of something hot and caffeinated and eat a decent meal before blowing back out of town on a breeze as blustery as the one that carried him into tiny Starlight, Iowa. Dante shivered. Would he ever be warm again? “Welcome to Barney’s.” A grin creased the woman’s lips. “Grazie, signora.” He dropped onto a counter stool, parked the dark brown hat on the adjacent seat, and rubbed his hands together to coax them back to life. If he'd possessed the gift of foresight, he’d have stopped somewhere and bought a pair of thermal gloves. Living in Italy must have numbed his brain. After opening the menu, he perused the offerings. The names of the specialties were plenty interesting: Jake’s Jumpin’ (or Julia’s Tame) Chili, Ben’s Boatload of Beef Burger (Antacids on the Side), Hannah’s Broccoli’s-Really-Good-For-You Soup, Pastor Ted’s Heavenly Ham & Swiss Sandwich, Angie and Harry’s (No Bones) Chicken Soup and Dylan’s Where’s-The-Fire? Burrito. With names like that, there had to be some fun stories and people behind them. That kind of thing made small-town living special. Dante closed the menu and stacked it with the others on the counter, resolved to order whatever was available and quick. He surveyed the place. Nice little diner, well-maintained and quiet. The black and white checkerboard floor was accented by red vinyl seats on the chairs, booths, and counter stools. A handful of customers spoke in low tones and darted curious glances his way. Although he turned aside, he sensed the eyes on his back, the speculative whispers. The better option might have been a fast food drive-thru, but the billboard advertising Barney’s Diner a few miles back on the highway had captured his attention. Good thing, since he’d been distracted by aching muscles. Hunching over the steering wheel for hours could do that to a guy. Otherwise, he might have missed Starlight altogether. He did have a reason to stop at Barney’s, after all. The letter. Dante patted the inner pocket of his jacket and breathed a sigh of relief. Still there. “Nice to meet you. Picasso?” He hoped the question might distract her. “Just passing through, signora.” His mistake was drumming the fingers of his right hand on the counter. The ring was a bit ostentatious, but it was a personal badge of honor. Among his most prized possessions, it reminded him how far he’d come and symbolized a hard-fought battle in his third year with the Italian Soccer League. “Sounds great. Grazie mille.” His stomach growled, reminding him it’d been seven hours since he’d ingested weak minestrone soup and a half-wilted salad in a no-name roadside diner a couple of states back. A gust of cold December air blasted him as the front door flew open, the bell jingling away. Dressed in a light blue knit hat, jeans, a white parka, and snow boots, a young woman stepped over the threshold of the diner. With effort, she leaned against the door while the wind howled outside. Dante jumped from his seat, moved around her, and gave the door a firm push. She graced him with a bright smile. “Thanks.” Eyes the color of dark chocolate—with a hint of warm, melting caramel—met his. With her cheeks flushed pink and snowflakes dancing on dark lashes, she was lovely. When Amanda pulled off her hat, a mass of loose, honey-blonde curls tumbled past her shoulders. “Molto bella,” Dante said under his breath. The last rays of sunshine shone through the picture window behind her, forming a sort of golden halo around her glowing face. Wow. Christmas season or not, all the driving must be getting to him. Next he’d be seeing Santa, flying reindeer, and elves. “You, too.” Amanda tilted her head. “Aren’t they all?” Her lips creased into an inviting smile. “I’d like to hear it sometime.” This woman was no shy wallflower, but her comment came across as simple curiosity rather than overt flirtation. Although he liked assertive women, he’d encountered far too many fawning, aggressive fans in the past few years. But Amanda seemed genuine, unassuming, and friendly. Amanda laughed. “Not many, I’m sure. I’m going to run over to Martha’s, and I’ll be back in a few minutes for that promised cup of coffee.” With a quick wave, she tugged on her hat and opened the door, setting that bell to its infernal jingling. “Was she a figment of my overactive imagination?” The question slipped out as Dante sank back onto his seat. He hadn’t intended to say it out loud, and he needed to leave before Amanda returned. His brain told him one thing, but why did everything else in him urge him to stay? Something about Amanda was different. Very special different. Need-her-in-your-life different.